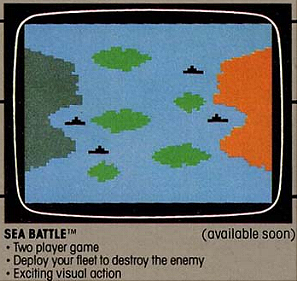 In case you didn't guess from the title, Sea Battle is a port of the Intellivision game of the same name. Sea Battle never saw release during the 2600's heyday, but Intellivision Productions produced a limited number of professionally produced carts in 2000. These carts sold out quickly and due to copyright restrictions the rom file has not released, making it still widely unavailable to most gamers. Sea Battle is a naval combat game in which two players must attempt to wipe out each others armada through a series of strategic battles. While it was a smash hit on the Intellivision, it's success on the 2600 would have been questionable. The Intellivision version made use of all the keys on the keypad, but since the 2600 lacked a keypad the game had to be simplified. Certain features such as laying mines had to be cut out, taking away some of the challenge. Also simplified were the graphics since the 2600's display abilities were well below that of the Intellivision. This left the game looking very blocky, and rather ugly. The final nail in Sea Battle's coffin was the lack of a one player mode, Mattel didn't want any more two player only games (see Sword Fight). 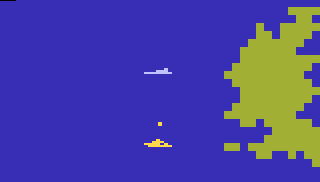 Even though the 2600 version of Sea Battle was watered down (no pun intended), it's still fun to play. The 2600 library is fairly void of serious two player strategy games, and Sea Battle would have made a nice addition. 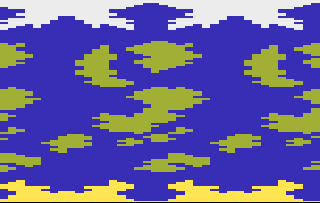 But without a single player option and blocky graphics, Sea Battle may not have had wide enough appeal to sell sufficiently. A screenshot mockup exists which shows the player's bases on the left and right side of the screen instead of the top and bottom. It's unknown if any version of the game was developed which featured the side bases.